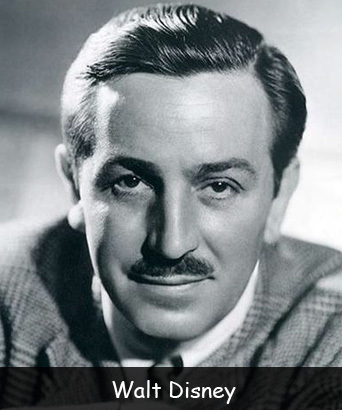 Walt Disney is one of the most influential Americans who ever lived. He actually succeeded in moving animation from a black and white novelty to a highly respected level. His most famous creations include Mickey Mouse, Goofy, Pluto and Donald Duck etc. Walt Disney was born on December 5, 1901 in Chicago, Illinois. His complete name was Walter Elias Disney. He dropped out of the school when he was 16 to sign up for the army during World War I but was rejected for being underage. Then he started to draw patriotic cartoons for his school newspaper. Walt Disney started a company called Laugh-O-Gram as he wanted to make his own animation cartoon. In spite of popularity of his cartoons, he was not able to make enough money and had to declare bankruptcy. He created the first animated movie with sound, Steamboat Willie that starred Mickey and Minnie Mouse. Mickey Mouse was originally named as Mortimer Mouse. Later, Lillian Disney, Walt Disney’s wife suggested the name ‘Mickey Mouse’. Disney lent his voice to his animated character Mickey Mouse until 1947 when it was turned over to English voice Jimmy MacDonald. Oswald, the lucky rabbit was first big hit of Walt Disney. In 1932, he decided to make a full length animated film, ‘Snow White’ which was a crazy idea according to industry insiders. The film was finally released in 1937 and became the top film of 1938 with a huge box office success. He holds the record for receiving the highest individual Oscar awards (22) and nominations (59). Contrary to an urban legend, he was not cryogenically frozen after his death. His body was actually cremated. He came up with an idea to create an amusement park with rides and entertainment. He opened Disneyland in 1955. The total cost to build this park was approximately $17 million. Walt Disney, a long time smoker was diagnosed with lung cancer and eventually died on December 15, 1966 at the age of 65. Declan, Tobin. " Walt Disney Fun Facts for Kids ." Easy Science for Kids, Apr 2019. Web. 21 Apr 2019. < https://easyscienceforkids.com/walt-disney-fun-facts/ >.